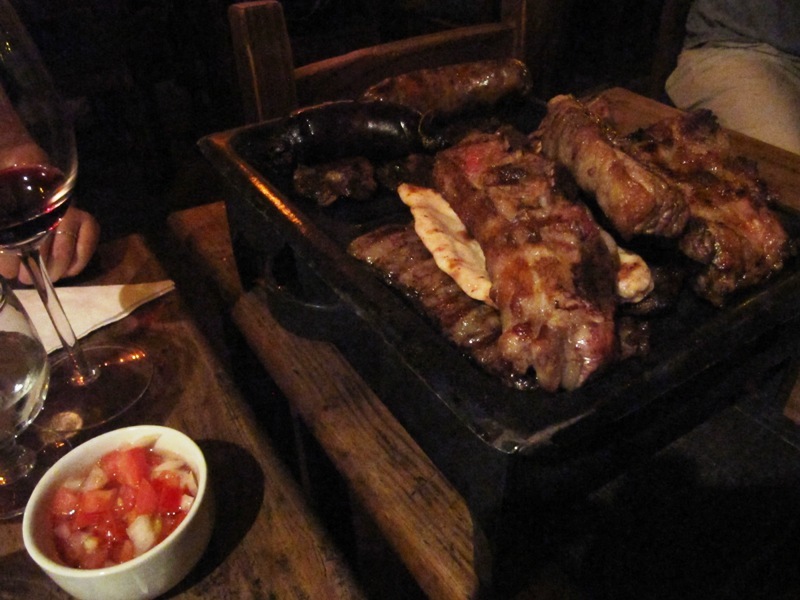 Traditional food in Buenos Aires revolves around meat. Steaks are all that the guidebooks talk about with mouth-watering descriptions that insist that there is some magic to the Argentinean BBQ found nowhere else in the world. We tried all sorts of steaks- at nice restaurants, corner shops and street food and I assure you that you have had better steak. As Carmen mentioned, salt is often the only seasoning used in Buenos Aires. It is ironic that the entire continent of South America was colonized in the search of pepper, yet pepper is not even used when grilling meat. However, the variety of cuts available is great. 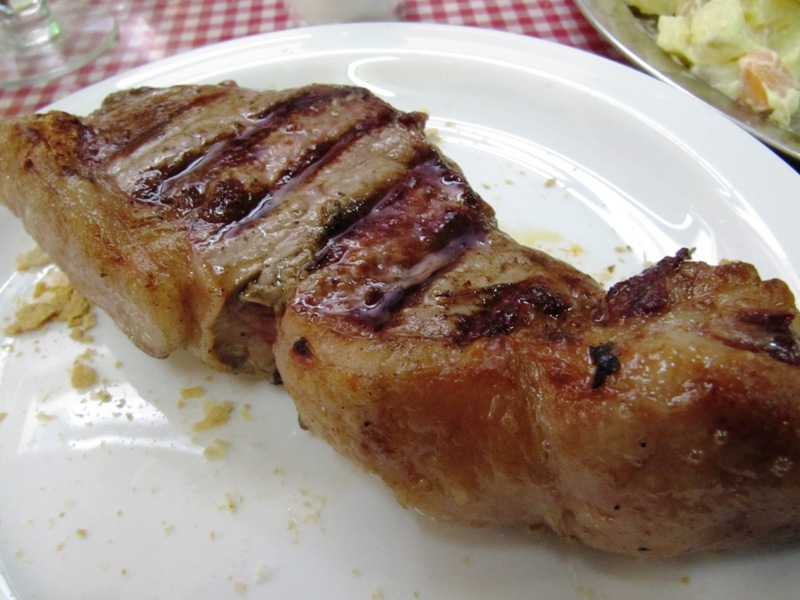 The most common is the bife de chorizo which is a sirloin steak. One way to try several types is to order the parilla mista that includes sausages, short ribs, flank steak, maybe some kidneys and some chicken. They usually say they serve 2 people, but expect it to serve at least 4. 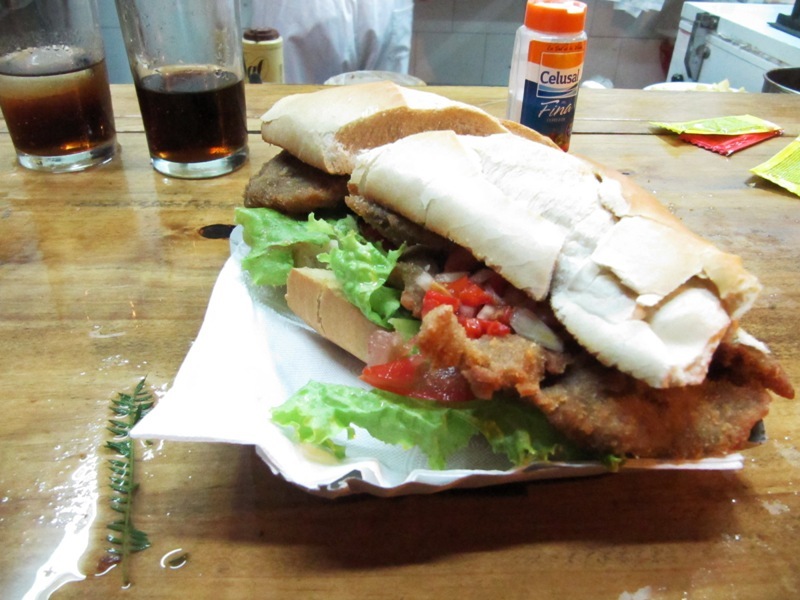 A more balanced meal comes in the form of the sandwich milanesa. We picked this one up at La Española in the Congresso neighborhood. The easiest way to describe it is a beef schnitzel sandwich stacked full of veggies, cheese and flattened, breaded steak. The empanadas have been a go to lunch food for Carmen and me. Empanadas are found all around the city. They are sold in tiny little standing-only shops and also sold from baskets on the street corner. 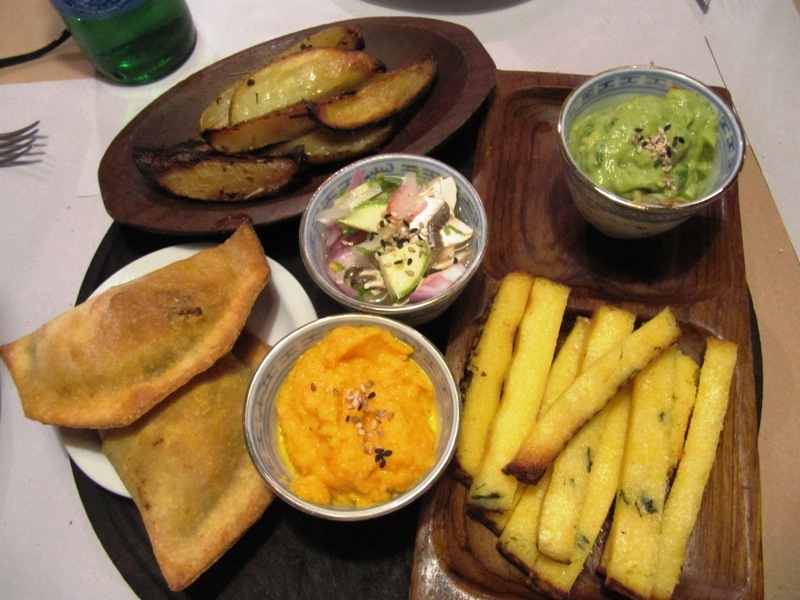 Every restaurant has empanadas and everywhere there are variations on the same regional specialties. 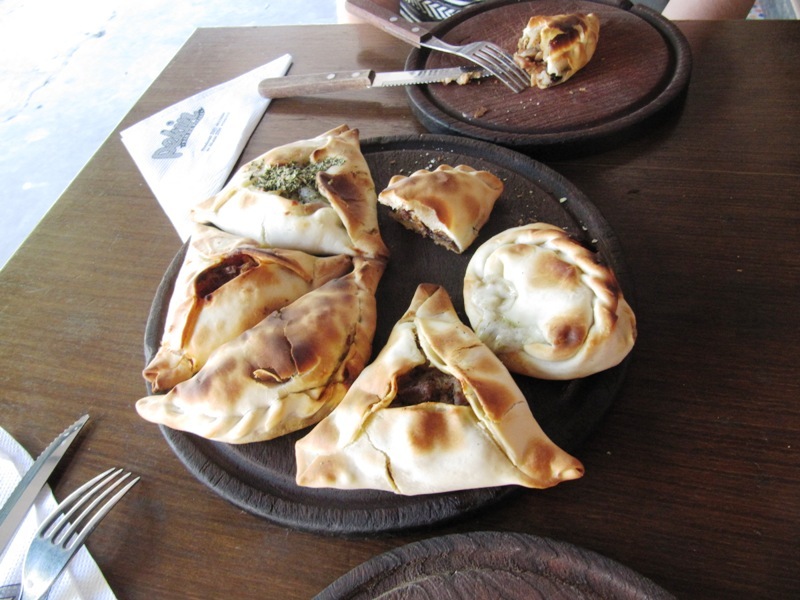 We preferred the empanada de salteña filled with ground beef, olives, hard-boiled egg and roasted peppers. There were all sorts of variations that included cheese, chicken, spinach, tuna, sardines and corn. We already discussed some of our favorite desserts – the dulce de leche ice cream and the alfajores are very good throughout the city. 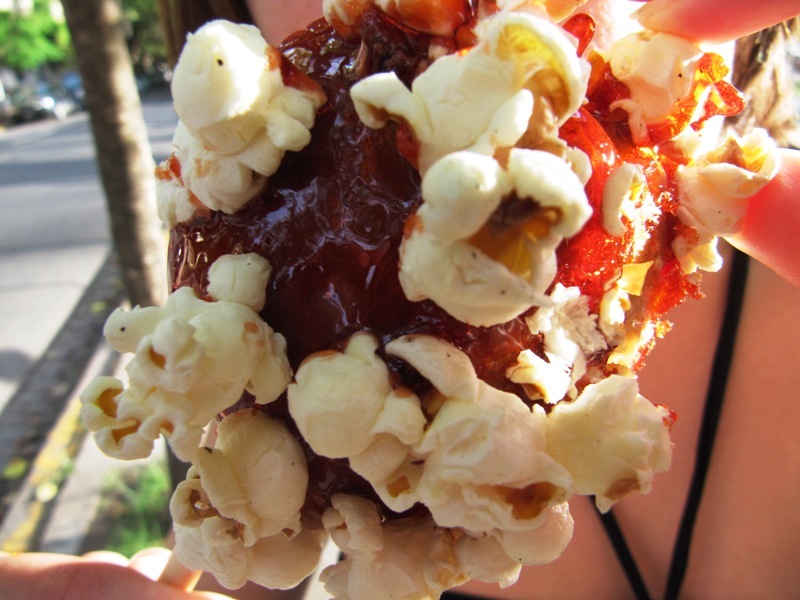 At street fairs they offer candied apples coated in popped corn. This gave it fun texture but is a bit challenging to eat. Sometimes the meat heavy meals become too much for us and we need to eat something that digests easily and quickly and of course is stacked high with veggies. 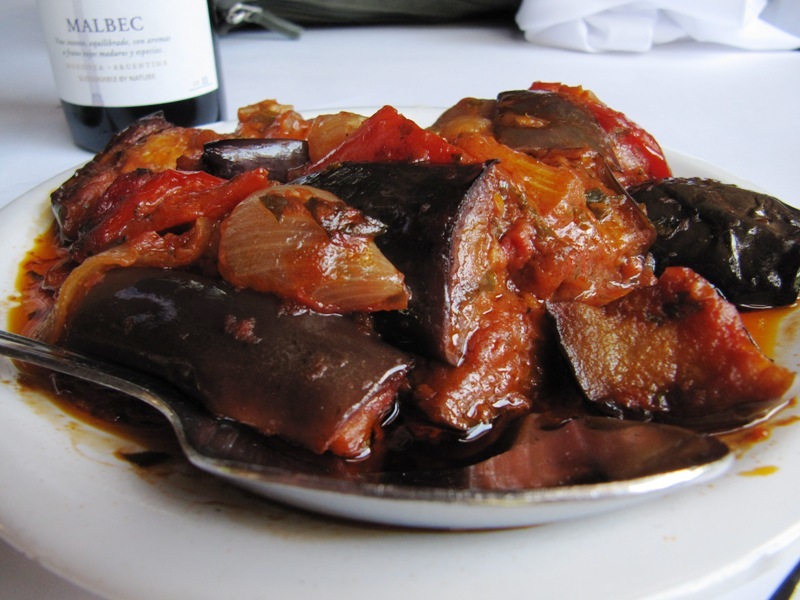 It was so easy to go meatless in San Francisco and finding amazing vegetables here in Buenos Aires has been a real challenge. A restaurant named Artemesia has been a stand-out as one of the best meals in Buenos Aires. 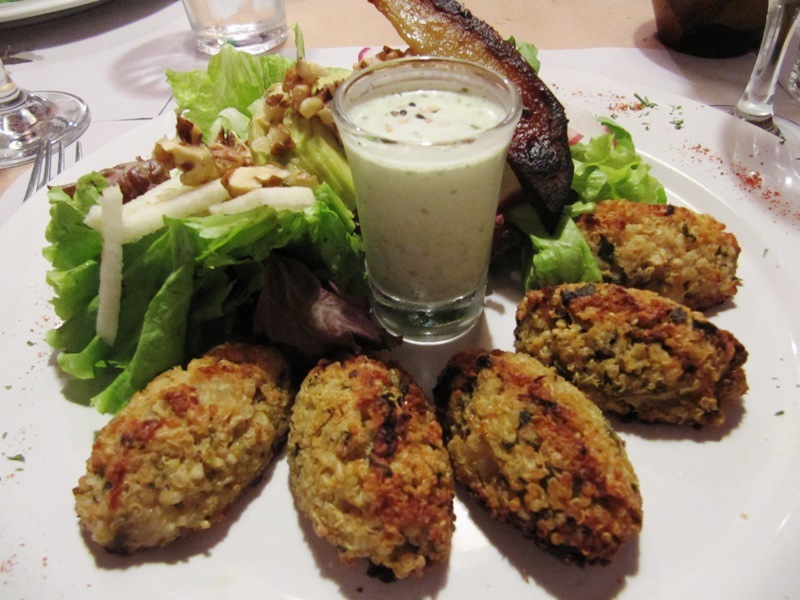 We ordered some delicious salads, veggie platters and even some quinoa fritters. Traveling to metropolitan cities has its benefits in that food from around the world is available from the many immigrants. Carmen and I could not pass up on this Korean restaurant named Bi Won. 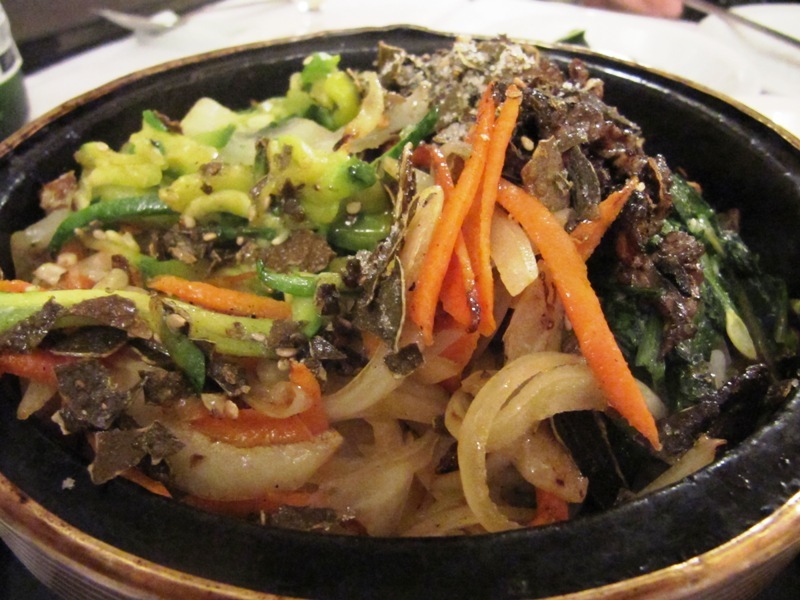 We ordered Bi Bim Bop and Beef Bulgogi and it came with 30 or so small plates of different picked veggies and kimchi. I was craving spicy food and finally I found it here. 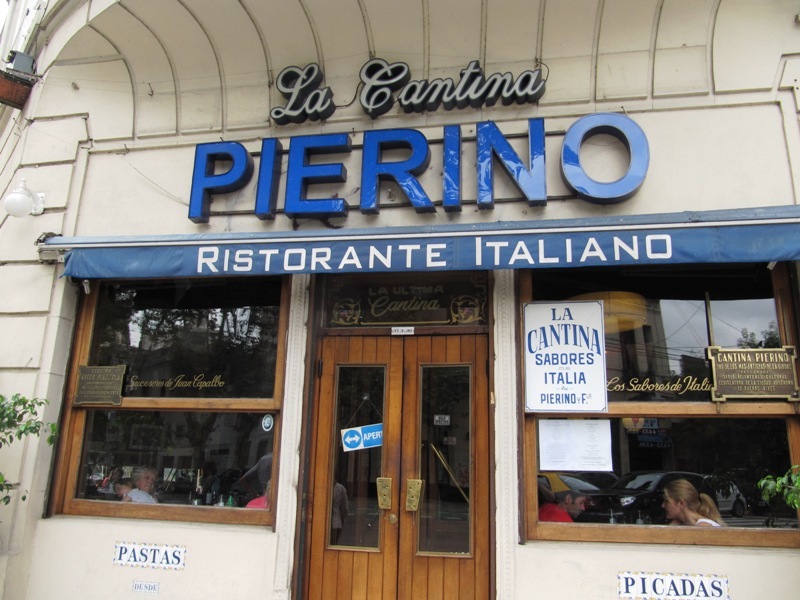 And the best restaurant of Buenos Aires…Pierinos. Just as Italian immigrants found their way to New York, many also settled in Argentina. 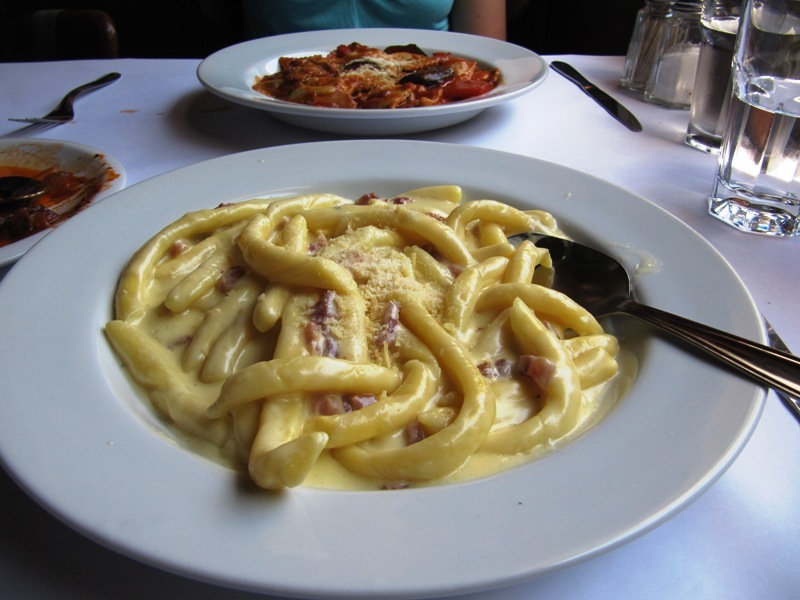 Therefore, the amount and quality of Italian food available in the BsAs is really impressive. 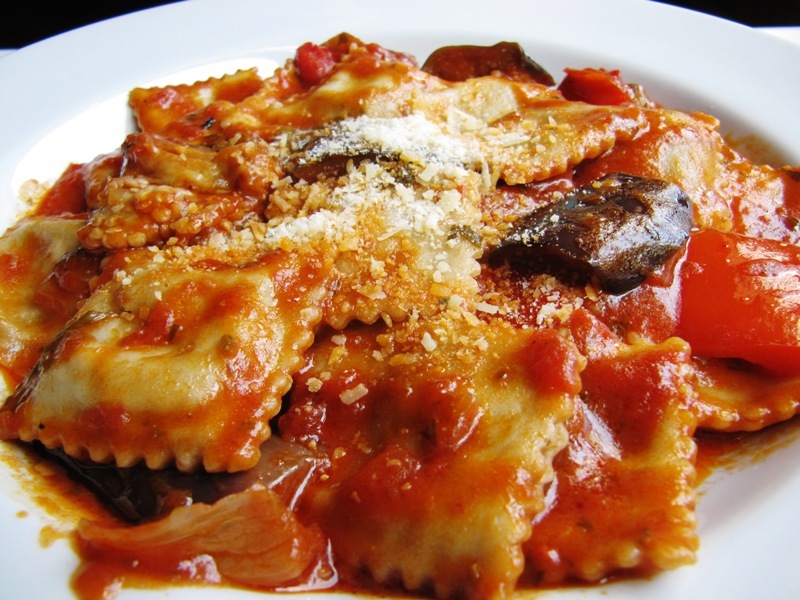 It is easy to find Italian dishes on almost every menu and most neighborhoods have these amazing fresh pasta shops where you can buy your homemade pasta and sauce and bring it home to cook. Pierinos served hand-made pasta and which you top with your choice of a dozen different sauces that were out of this world. We mostly stuck to the slow-cooked tomato sauces although the carbonara was yummy too. It tasted like pure comfort food. Overall the food scene in Buenos Aires is good. There are tons of great restaurants. But there are also a ton of restaurants serving up dish after dish of bland meals. Carmen and I definitely found some misses, but it was worth it to find the winners.